The company that operates the New Haven Register, The Middletown Press and The Register Citizen in Torrington is called “Digital First Media,” but on Wednesday, it will unveil a significant investment in improving its newspapers’ print editions. Our dailies in Middletown and Torrington have been redesigned to incorporate modern typography, better organization and pages that allow photography and advertising to stand out. Bucking the trend, it will mean a net increase in page count in Middletown, and the addition of a number of new features at both papers. This includes investment in a new seven-day lineup of featured Page 3 news columnists, including popular former Hartford Courant columnist Susan Campbell and controversial and thought-provoking Connecticut defense attorney Norm Pattis. Digital First used in-house talent – Tiffany Grandstaff and Alex Fong of the San Jose Mercury News – to develop the redesign. Former Bergen Record editor Frank Scandale, in a newly created position of vice president of print production, is spearheading the rollout of the new design across Digital First’s 74 daily newspapers. Torrington and Middletown were chosen to go first. The company’s newly launched “Thunderdome” operation in New York is providing some national news and feature elements of our redesigned page lineup, freeing staff in Connecticut to expand local news content. The new design will come to the New Haven Register early next year, as the process is expanded to accommodate larger dailies. Around the same time, we expect to unveil the company’s long-awaited new website design. It is also being developed in-house by staff at the Denver Post, which recently wowed the newspaper industry with a new iPad app design that will also soon be coming to our dailies in Connecticut. While there is no denying the declining trend in print newspaper readership and advertising, we can do a better job serving the users of print who remain. If that slows the decline and provides us with a longer runway to a digital future, even better. 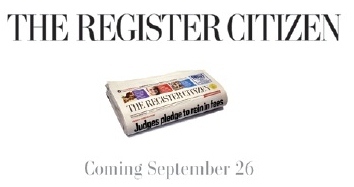 It’s also interesting to note that the last significant change in the design and content of the print edition of The Register Citizen or New Haven Register, for examples, took place before personal use of the Internet was commonplace. We are long overdue for print editions that reflect their curative role and position in the 24-hour news cycle.